Mukambi Safaris is a Dutch family run safari company in Zambia with three camps in Kafue National Park, one of the largest unspoiled wilderness areas in the world. The three camps are Mukambi Safari Lodge, Busanga Plains Camp, and Fig Tree Bush Camp. Activities consist of game drives, sunset boat cruises, fishing trips and walking safaris on which you are likely to see elephant, lion, leopard, cheetah, and hippo besides an incredible variety of birds. Mukambi Safaris combines romance and exclusivity with warm and attentive service. Welcome to Mukambi Safari Lodge, gateway to the Kafue National Park in Zambia. Surrounded by one of the largest areas of unspoiled wilderness in the world. Fig Tree Bush Camp is a unique camp in an undiscovered part of Kafue National Park and has been chosen after years of admiring its wilderness and beauty. Busanga Plains Camp is our first seasonal wilderness camp, situated deep in the heart of the famous Busanga Plains, a stunning and unique wetland area in Kafue National Park. 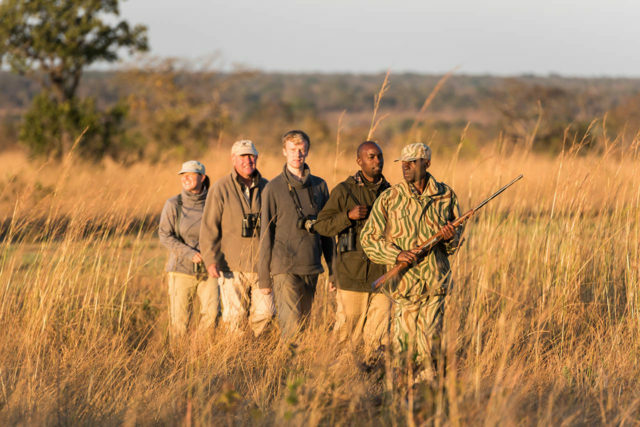 The game drive offers the greatest opportunity for spotting game as a large area is covered. The Kafue has all the big African cats as well as the smallest. But with our experienced and highly qualified guides you will experience much more. The walking safari is an educational activity introducing the guests to the plant and insect life at their feet. Our experienced trackers give detailed descriptions of what the animals have been up to and how best to go about finding them. The boat cruise is a tranquil activity which allows guests to put their feet up and enjoy the scenery. Guests can view the vastness of the mighty Kafue River and acknowledge the unique ecosystem which our guides are more than willing to educate guests about. The fishing trip gives the opportunity to relax and try one’s hand at catching some large fish. Some of the most common fish caught include bream, Kafue bream, silver barbel and Kafue pike. It’s also about being at one with nature and your surroundings. Conservation plays a major part in everything we do in Kafue National Park. We work closely together with Department of National Parks & Wildlife, and with conservation organizations like the Zambian Primate Programme and Panthera, on conservation goals. In 2002 Edjan, Robyn and their young daughters moved from the Netherlands to Mukambi Safari Lodge to start an adventure of a lifetime. Their main motivation was to make a difference both for Kafue National Park and the local communities. Mukambi Community School provides education to those living in an area where no good schools exist. Results are spectacular; the school now provides 80 local children with a high standard of education, and five teachers have permanent employment. Responsible tourism must come from a real desire to make a difference. All three camps run on 100% renewable solar energy and Mukambi Safari Lodge was the first in Zambia to install the most environmental friendly battery technology LiFePO4. Service and accommodation is excellent, and a dip in the sparkling pool is a great way to cool off. The Sundowner Cruise along the Kafue River is not to be missed… Mukambi Safari Lodge is the sort of place to which you feel compelled to return…..often. There really aren’t words to express how incredible the Mukambi Lodge and Safari experience was for us. The staff is amazing, and they make sure to personalize the experience. The accommodations are excellent, just the right combination of rustic and luxe. The food is incredible and the service impeccable. And that doesn’t even begin to describe the safari experience. Lions, elephants, hippos, zebras, monkeys, baboons — all up close in the most breath-taking setting we could imagine. We stayed at Fig Tree, which is highly recommended for anyone who wants to disconnect and become immersed in the experience. All I can think of is how to get back there. Paradise. We were also lucky enough during our visit to stay at the new bush camp Fig Tree. Wow! The 3m high tents in the tree canopy are a thing of beauty. There is nothing quite like having the bespoke tent "windows" down, waking to the sight and sound of the tree leaves in the calm breeze. Incredible. There is a wonderful boma area and fire pit in the sand below. The hammock on the beach overlooking the lagoon is a real treat, spend an afternoon here listening to the birds and watching the array of wildlife pass you by. We just loved this lodge! The staff were so friendly they really couldn't do enough for us. The meals were not only totally delicious they were taken in their lovely dining room overlooking the river. Our accommodation was in a "permanent" tent overlooking the river. The view was a dream and we couldn't have asked for a more fitting place to drink our afternoon G&Ts. Thank you so much! Our tented accommodation was spacious and comfortable with a shower inside and a bath out on the balcony overlooking the river. The lodge supports a local community school and I was taken there for a visit. The students sang a song of welcome when I arrived. Before I left they sang a farewell song, "We're saying goodbye but not for ever." I hope it won't be for ever. I really want to go again and stay longer next time. Mukambi is a gem along the river. The food was magnificent, the lodging was lovely, and the views were magnificent. The colours of the sunsets here are breath-taking. The game drives were excellent, the drivers very well educated, kind, and easy to chat with en route. We really did not want to leave this special place in the world. We travelled up to the Busanga Plains the following day. Magical! Words cannot convey the beauty of the plains and how special it is. The plains camp is an oasis of calm surrounded by lechwe, lions, elephants, true wilderness. It is phenomenal, and the staff are a true asset, attentive, friendly and extremely welcoming. The Busanga plains is the jewel of the Kafue and is renowned for the concentrations of game. 720 square kilometres and three camps in total means that you are not going to be crowded, that is for sure. The game viewing was superb and so was the camp. The tents are beautifully appointed and with great outdoor showers. The staff are all friendly and helpful and everything worked very well indeed. I would recommend this camp to anyone wishing to see Busanga. Mukambi Safari Lodge is the gateway to the Kafue National Park in Zambia. Surrounded by one of the largest areas of unspoiled wilderness in the world. Mukambi Fig Tree Bush Camp is a unique location in a undiscovered part of Kafue National Park and has been chosen after years of admiring its wilderness and beauty.